York's A Varsity Relay Team swimming the 400 Freestyle Relay. 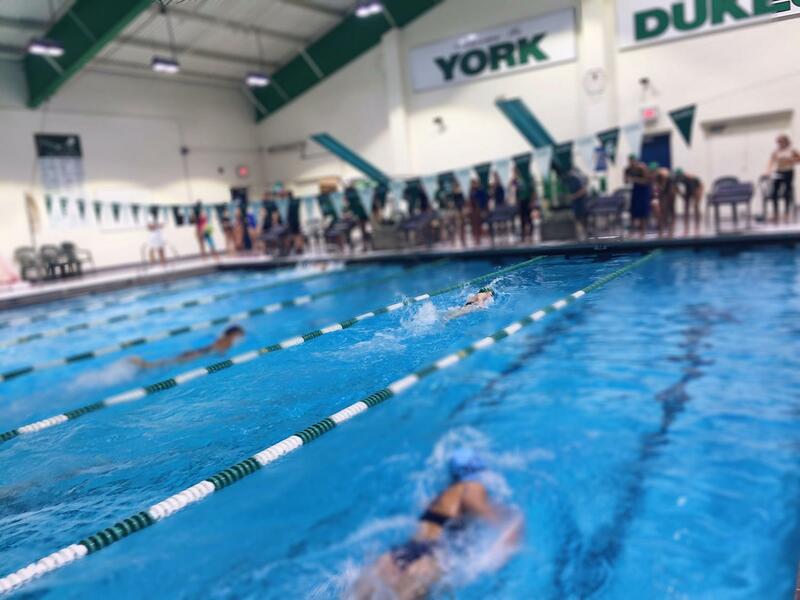 Tuesday, Sept. 4 at York’s Triangular Swim and Dive Meet, the York girls swim team continued their winning streak. Addison Trail and Willowbrook received 76 points, Riverside Brookfield scored 107, and York won the meet with a score of 132. The Dukes started the meet, per usual, with a unified chant showing team and school spirit lead by the senior athletes, ending with cheers from the fans. 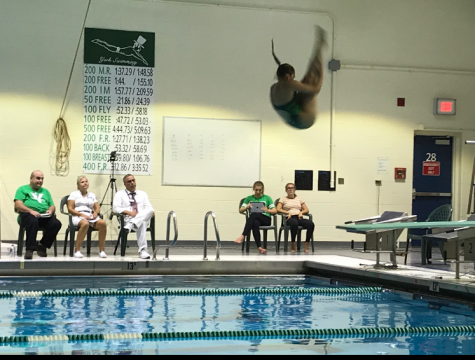 After the rally of chants and cheers, the diving team started their meet. Because this is an individual sport, each of the girls is reliant on themselves to compete at their best ability, but the team is able to help guide them. Junior Hanna Homan preparing to do a reverse one summersault in the tucked position. Brigitte Kammerdiener doing a back dive pike. “Swim meets are really fun because you get to cheer on your teammates,” first-year swimmer Savannah Nichols, sophomore, said. This year especially, there has been an emphasis on the importance of sportsmanship, helping the girls work better both as individual athletes and as a team. “I learned there are bigger things than just wins and losses, and for me, it’s bigger than just getting first place or being the best, it’s bringing the best out of your athletes in terms of who they are rather than what they do,” Coach Skalon, Varsity Head Coach, said. During the night, Skalon had the swimmers cheering for the Junior Varsity 200 meter Freestyle. York won the event with a 1:56.94. Sophomore Madison Sardo with a 28 second, Sophia Ladpodka with a 31 second, Hannah Lonergan with a 30 second, and Julia Beltran with a 26 second. Junior Erin Peterson swam breaststroke during the meet for Varsity, a new territory (varsity) for her swim season. “The meet went well for me, I did not gain any time from my personal records. I had so much fun cheering for my friends that I even lost my voice,” Peterson said. While the swim team is very serious about winning, they are still able to understand the importance of fun. 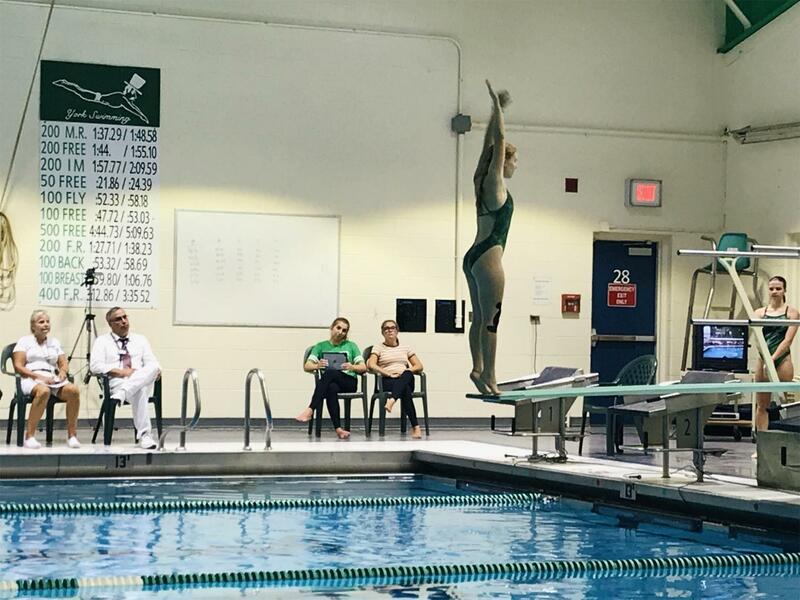 The seasons looking bright and positive for the dukes, and freshman swimmer Ciara Belfiore encourages students to come and cheer for their fellow peers.